I have been a fan of Party Cup Express for all my "party" needs since moving back to NOLA. 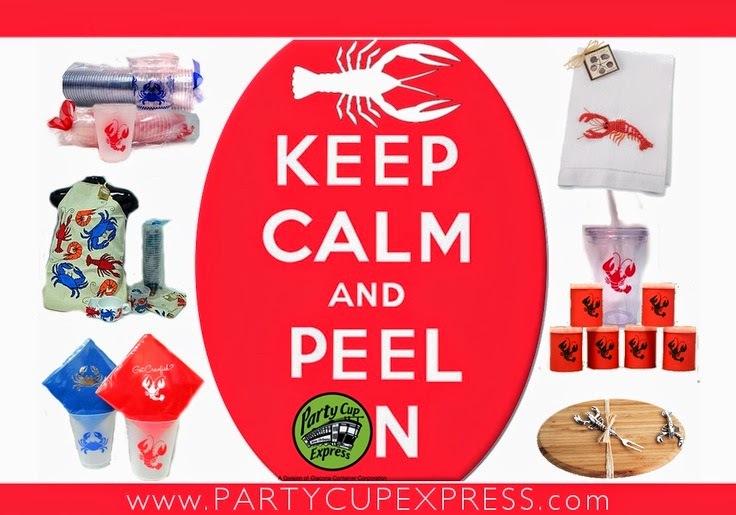 I am happy to announce that my friends at Party Cup Express have contacted me again with a fantastic give away offer for my readers and followers. 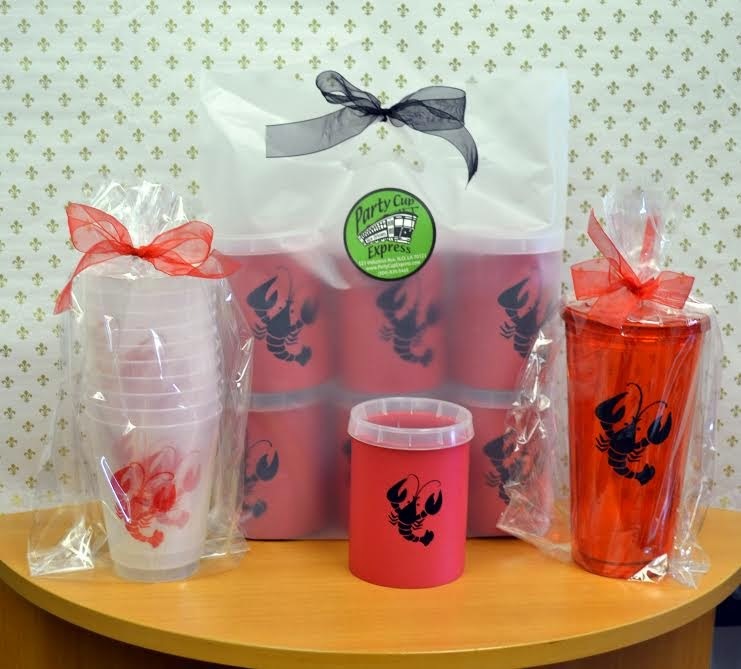 Party Cup Express would like to offer a pack of 6 crawfish koozies, a 20 oz. acrylic tumbler, and a 10 pack of frost flex crawfish cups. 1. "Like" Party Cup Express on facebook and leave a comment (one chance). 2. "Like" Uptown Acorn on facebook (one chance). 3. Leave a comment on this original blog post telling me what you will do with your "wins" (one chance). The contest is open to residents of the continental U.S. only. The contest starts now and ends on Monday, July 21 at 6:00 AM Eastern time. Please visit Party Cup Express for more: click HERE. This would be fun for a summer party! Great giveaways as always! It's great to see you blogging again - I always look forward to your posts! If I won these cups I'd use it for my next low country boil! I'm glad to see you blogging again - I always look forward to your posts! If I were to win the giveaway I'd use the cups for my next low country boil! If I were to win this giveaway, I would share it with my son. Welcome home my friend! I will fill them with fabulous beverages with friends, of course! We're heading to NOLA in Oct to celebrate my husband's 40th...these would be perfect to pack! Hi Ron! Love your blog! I would love to have those cups. I'd take them to the tennis courts when I play. My pals and I would be able to cool off with our ice water in these stylish cups. The koozies would hold the diet Pepsi. How perfectly Marvelous we would look!! I would use them at all our grill parties! I would gift them to our fabulous neighbors that always invite our family over for their get-together events. Not on Facebook, Ron, so this will be my "chance." Were I to win this giveaway, these goodies would be perfect for enjoying on the patio. We recently had neighbors come for "pie on the patio." Hi Ron- welcome back! I won't enter since I recently won a giveaway but that looks really awesome! Oh fun! Great giveaway Ron! I would love to use these on the deck this summer! Would love to use at a neighborhood gathering. Thanks for the chance. Hey Ron! Sorry I am late in entering this giveaway...swim lessons and enjoying summer! If I win I would take them on our SC beach vacation and use it for our annual Lowcountry boil dinner! Ron, I would use these for entertaining in our new home. You know how much I love anything coastal inspired. Hi Mr. Uptown Acorn. I love having anything Louisiana-inspired in our TX home for my sweet husband who was washed into my Houston arms by that storm whose name we shall not mention. So when I win your latest give away we will use them when we entertain on the back porch. Your Vegas trip looks like an amazing time! Thanks for sharing. I love your giveaways. Hopefully I'll win this one. The cups are precious. The cups are so nice!! I'd throw a little party for friends & family to use them. Thank you for the chance! I like your blog & enjoyed the Vegas birthday pics! Happy Belated Birthday Greg! Contests just exhaust me, because I know I won't win, because I never win anything. Never have. But I love that it may help a local business, which I'm all about that, so I go through the process. It's just exhausting I tell you! Would Love to win these cups! Found your blog on Dixie Delights and am so glad I did! Love your style and keeping my fingers crossed! Have a party of course!!!! Throw a party!!!!!! You're invited too Ron!!! Hmmm…..so may options! Have some friends over for a mid-summer party!